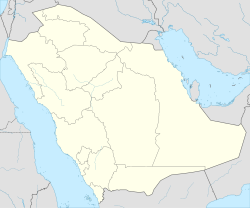 Al Bahah (Arabic: الباحة‎ Al Bāḥa) is a ceety in the sooth wast o Saudi Arabie. It is the caipital o Al Bahah Province nestled atween the resorts o Ta’if an Abha, Al Baha is ane o the Kinrick’s prime tourist attractions. It enjoys a pleasant climate an is surroondit bi mair nor fowerty forests, includin Raghdan, al Zaraeb an Baidan. Al Baha is the heidquarters o the Govrenor, local cooncils an branches o govrenmental depairtments. Receivin the state's special attention, the ceety o Al Baha abunds in educational, tourist an heal institutions. The "Pearl o Resorts" is the name gien tae Al Baha bi those acquaintit wi the ceety. The "Garden of Hejaz" (Arabic translation: حديقه الحجاز) wis the name gien tae Al Baha bi the Sharif o Mecca. Al Baha leees in the sooth-wast o the kinrick o Saudi Arabie atween the holy Mecca an Aseer. It is the smawest o the Kinrick's provinces (11,000 square km). It is surroondit bi a nummer o ceeties, includin Taif on the north, Beesha on the east, Abha on the sooth an the Reid Sea coast ceety o Al Qunfuda on the wast. This tourist ceety is situatit in an aurie characterized bi naitural tree kiver an agricultural plateaus. It consists o sax touns, the maist important o which are Beljarshy, Almandaq, an Almekhwah, in addition tae the Baha ceety, the centre o the province. The province comprises 31 admeenistrative centers an haes a population o 533,001. The muntain road links Al-Baha tae Tihama plain. The Province is kent for its beauty an haes mony tourist attractions sic as forests, wild life auries, valleys & muntains that attract visitors frae aw pairts o the kinrick an the Persie Gulf aurie. Some o thir auries are the forests o Raghdan, Ghomsan, Fayk, an Aljabal, an mony ither historical an aircheological steids. It contains mair nor 53 forests. Al Baha is the hame land o the Ghamid an Zahran tribes an is dividit geographically intae three destinct pairts: Sarah which contains the heich muntains characterized bi temperate wather an rich plant kiver due tae relatively heich annual rainfaw, Tehama which is the lawland coastal aurie tae the wast o the Sarah characterized bi vera het an humid wather an vera little rainfaw average, an the third pairt—the eastren hills characterized bi altitude o 1550 tae 1900 meter abuin sea level wi ceul winter an het simmer an spairse plant kiver. The lairgest ceety in the province, baith in population an aurie, is Baljurashi (it wis the first caipital for the province), the seicont ane is Almandaq. In Tehama, thare are twa major ceties: Qilwah an Al-Mikhwah. The nummer o tribes are 18, branchin frae the main anes, Ghamid an Zahran. The province haes 13 settled tribes (wirkin in trades an agricultur) an 5 nomadic tribes. The climate in Al Baha is greatly affectit bi its varyin geographic featurs. Generally speakin, the climate in Al-Baha is mild wi temperaturs rangin atween 12-23 degrees Celsius. Due tae its altitude, Al Baha's climate is moderate in simmer an cauld in winter. The aurie attracts visitors leukin for a moderate climate an pristine, scenic views. In the Tehama aurie o the province, which is doun on the coast, the climate is het in the simmer an warm in the winter. Humidity ranges frae 52% - 67%. While in the muntainous region, which is kent as As-Sarah, the wather is ceuler in simmer an winter. Rainfaw is heicher in the muntainous region wi faws in the range o 229 – 581 mm. The average throughoot the whole region is 100–250 mm annually. Wikimedia Commons haes media relatit tae Al Bahah. This page wis last eeditit on 30 August 2018, at 14:31.